The Book of Job is the greatest Jewish work of art and one of the masterpieces of world literature. Its theme is nothing less than human suffering and the transcendence of it; it pulses with moral energy, moral outrage, and deep spiritual insight. Because Job is the archetypal victim, a good man who must suffer for no good reason, his story can serve as the central parable from our post-Holocaust age. 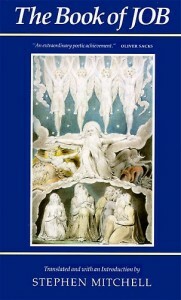 Now the Book of Job has been translated by the eminent translator and scholar Stephen Mitchell. This is the first time ever that the Hebrew verse of Job has been translated into verse in any language, ancient or modern, and the result is a triumph. This edition contains a brilliant introduction by Mr. Mitchell, which illuminates God’s answer from the whirlwind. One of the milder paradoxes that shape this greatest Jewish work of art is that its hero is a Gentile. Its author may have been as well. We know nothing about him, nothing about his world; he is even more anonymous than Homer. With Homer, at least, we can picture a society of competing principalities, each with its warriors and court and ceremonial feasts where the bard recites his ancient songs to the accompaniment of the lyre, like blind Demodocus in the Odyssey. But there is not the slightest bit of evidence about the author of Job: not when or where he wrote, or for what kind of audience. When we try to imagine him, we are left with a blank, or with one of those patriarchal figures dressed in bright monochrome robes who suddenly appear, devout and straight-nosed, between the pages of illustrated Bibles. Yet however foreign the poet originally was, his theme is the great Jewish one, the theme of the victim. “Someone must have slandered J., because one morning he was arrested, even though he had done nothing wrong.” That is what makes Job the central parable of our post-Holocaust age, and gives such urgency to its deep spiritual power. To introduce his poem, the author retells a legend that was already ancient centuries before he was born. It concerns a righteous man who for no reason has been deprived of all the rewards of his righteousness; in the midst of great suffering he remains steadfast and perfectly pious, still blessing the Lord as before. “You have heard of the patience of Job,” the Epistle of James says, and it is this legendary, patient Job — not the desperate and ferociously impatient Job of the poem — who, ironically enough, became proverbial in Western culture. We can respect the legend on its own naive terms, and can appreciate the skill with which the author retells it: the chilling conversations in heaven; the climax where Job submits, as if he were a calmer, more insightful Adam who has just eaten the bitter fruit of the Tree of Knowledge and, eyes opened, sees that he is naked. But if we read the prologue more seriously, less objectively, we may be slightly repulsed by its hero’s piety. There is something so servile about him that we may find ourselves siding with his impatient wife, wanting to shout, Come on, Job; stand up like a man; curse this god, and die! The character called “the Lord” can do anything to him — have his daughters raped and mutilated, send his sons to Auschwitz — and he will turn the other cheek. This is not a matter of spiritual acquiescence, but of mere capitulation to an unjust, superior force. When we look at the world of the legendary Job with a probing, disinterestedly satanic eye, we notice that it is suffused with anxiety. Job is afraid of God, as well he might be. He avoids evil because he realizes the penalties. He is a perfect moral businessman: wealth, he knows, comes as a reward for playing by the rules, and goodness is like money in the bank. But, as he suspects, this world is thoroughly unstable. At any moment the currency can change, and the Lord, by handing Job over to the power of evil, can declare him bankrupt. No wonder his mind is so uneasy. He worries about making the slightest mistake; when he has his children come for their annual purification, it is not even because they may have committed any sins, but may have had blasphemous thoughts. The superego is riding high. And in fact, at the climax of his first speech in the poem, Job confesses that his “worst fears have happened; / [his] nightmares have come to life.” This is not a casual statement, added as a poetic flourish. Anxieties have a habit of projecting them- selves from psychological into physical reality. Job’s premonition turned out to be accurate; somewhere he knew that he was precariously balanced on his goodness, like a triangle on its apex, just waiting to be toppled over. There is even a perverse sense of relief, as if that heavy, responsible patriarch-world had been groaning toward deliverance. For any transformation to occur, Job has to be willing to let his hidden anxieties become manifest. He must enter the whirlwind of his own psychic chaos before he can hear the Voice. hold my life in my hands. I will speak the truth, to his face. If we compare the legendary figure with the later Job, especially in the great summation that concludes the central dialogue, we can recognize that even his virtue lacks a certain generosity and wholeheartedness. That is why the bet doesn’t prove much. Job is too terrorized, from within his squalor, to do anything but bless the Lord: for all he knows, there might be an even more horrible consequence in store. The real test will come later, in the poem, when he feels free to speak with all of himself, to say anything. There is a further irony about tam v’-yashar. When Job is handed over to the good graces of the Accuser, he is turned into the opposite of what the words mean in their most physical sense. He becomes not-whole: broken in body and heart. He becomes not-upright: pulled down into the dust by the gravity of his anguish. The author moves us to heaven after the prologue’s first scene, and we may be tempted to admire his boldness. But heaven, it turns out, is only the court of some ancient King of Kings, complete with annual meetings of the royal council and a Satan (or Accusing Angel). As below, so above. Jung, in his Answer to Job, makes the point that, psychologically, the Accuser is the embodiment of “the Lord’s” doubt. In a more naive version of the legend, the god in his divine myopia would himself doubt the disinterestedness of his obedient human and would decide to administer the test on his own. Here, though the Accuser ostensibly plays the role of the villain, it is “the Lord” who provokes him. “Did you notice my servant Job?” How can the Accuser not take up the challenge? After all, that’s his job. No, the god of the prologue is left behind as utterly as the never-again-intentioned Accuser, swallowed in the depths of human suffering into which the poem plunges us next. When Job discovers his voice after the long silence, he doesn’t curse God explicitly, as the Accuser said he would. But he comes as close as possible. He curses his own life, and in doing so curses all of life — an ultimate blasphemy for those who believe that life is an ultimate good. (We may recall another great sufferer, Oedipus at Colonus, whose chorus offers something very similar to Job’s death-wish as its wisdom: It is best never to have been born; next best is to leave the womb and die immediately.) In his curse, Job allies himself with the primal forces of darkness and chaos, and with the archetypal symbol of evil, the Serpent Leviathan, whom we will meet again at the poem’s conclusion. It is a ferocious hymn of de-creation. He must hurtle to the bottom of his despair before he can begin to stand up for himself. At the end of the prologue, when they are introduced to us, the three friends who come to comfort Job are entirely correct in their behavior. How much delicacy and compassion we can feel in the author’s brief account: “Then they sat with him for seven days and seven nights. And no one said a word, for they saw how great his suffering was.” But they can’t remain silent once Job becomes active in his anguish. Theirs is the harshest of comforting. They don’t understand that Job’s curses and blasphemies are really cries of pain. They can’t understand, because they won’t risk giving up their moral certainties. Their rigid orthodoxy surrounds an interior of mush, like the exoskeleton of an insect. Unconsciously they know that they have no experience of God. Hence their acute discomfort and rage. Even if the friends are right about God’s justice, their timing is bad. In fact. they don’t speak to Job at all, they speak to their own terror at the thought of Job’s innocence. And though they defend God’s justice, they can’t afford to understand what it is. “If the wrong man says the right thing, it is wrong.” So they are driven to their harsh God-the-Judge and their harsh judgments, like greater men after them who tried to justify the ways of God to men. Ultimately the dialogue is not about theological positions but human reactions. Afraid of any real contact with Job and his grief, the friends stay locked inside their own minds. The same arguments are recycled again and again, with more and more stridency, until they become merely boring. In the third round of the dialogue, in fact, the text itself becomes defective, as if it had broken down from the force of the friends’ stuttering rage. his faith is a spider’s web. and crept away with his plans? when a cow gives birth to a zebra. The friends, nevertheless, are supporting actors, and our attention is focused on Job. His speeches are a kaleidoscope of conflicting emotions, addressed to the friends, to himself, to God. His attitude shifts constantly, and can veer to its direct opposite in the space of a few verses, the stream of consciousness all at once a torrent. He wants to die; he wants to prove that he is innocent; he wants to shake his fist at God for leaving the world in such a wretched shambles. God is his enemy; God has made a terrible mistake; God has forgotten him; or doesn’t care; God will surely defend him, against God. His question, the harrowing question of someone who has only heard of God, is “Why me?” There is no answer, because it is the wrong question. He will have to struggle with it until he is exhausted, like a child crying itself to sleep. In these speeches it is obvious that Job is a different character from the patient hero of the legend. He is no longer primarily a rich man bereft of his possessions and heartbroken over his dead children (they are mentioned only once in the poem). He has become Everyman, grieving for all of human misery. He suffers not only his own personal pain, but the pain of all the poor and despised. He is himself afflicted by what God has done to the least of these little ones. In a wonderfully ironic sense, the Accuser’s dirty work has resulted in an epidemic of accusations. Once that archetypal figure disappears, he is absorbed into the poem as if by some principle of the conservation of energy. The more the friends become Job’s accusers, the more Job becomes the accuser of God. His outrage at the world’s injustice is directed straight to the creator of that world. There are no detours or half-measures, no attempt to deflect ultimate responsibility by blaming a devil or an original sin. he murders both the pure and the wicked. he laughs at the anguish of the innocent. and blindfolds its judges’ eyes. Who does it, if not he? All this bewilderment and outrage couldn’t be so intense if Job didn’t truly love God. He senses that in spite of appearances there is somewhere an ultimate justice, but he doesn’t know where. He is like a nobler Othello who has been brought conclusive evidence that his wife has betrayed him: his honesty won’t allow him to disbelieve it, but his love won’t allow him to believe it. On the spikes of this dilemma he must remain impaled. That is what makes his cry so profoundly moving. Of course, the answer Job receives is anything but what he expected. Heart-stirring as the summation is, he remains lost in his own concepts, and there is no small irony to his final plea, “If only God would hear me.” For if we needed a sensory metaphor to describe the experience of intimacy, hearing might be the last sense we would choose. No, far more than vindication will occur: a plea will be granted that Job wouldn’t have dared to make, a question answered that he wouldn’t have known how to ask. God will not hear Job, but Job will see God. To men some things are good and some are bad. But to God, all things are good and beautiful and just. If God’s answer comes from an objective whirlwind, it answers nothing, and can only be the magnificent, harsh, and notoriously unsatisfactory harangue that most interpreters have found. As rational discourse, it reduces itself to this: How dare you question the creator of the world? Shut up now, and submit. After several pages of eloquent browbeating, Job can do nothing but squeak what amounts to, Yes sir, Boss. Anything you say. God apparently wants the unquestioning piety of the friends, and Job returns to the exact position he had at the end of the prologue, cringing in the dust. Compared with the endings of the Iliad or the Commedia or any of the major works of Shakespeare, this would be a wretched climax: so uneconomical, so anticlimactic indeed, that it seems more like a pratfall than a finale. We need to penetrate more deeply. What does it mean to answer someone about human suffering? For there are answers beyond the one-size-fits-all propositions of the theologians. But these answers can’t be imposed from the outside. They will resonate only where the questioner lets them enter. Above all, they require a willingness to accept what can be excruciating to the ego. Often we find such reality unbearable. The light is so brilliant that it hurts, as in the Tibetan Book of the Dead, and we retreat to the softer glow of a familiar, comfortable grief. There is never an answer to the great question of life and death, unless it is my answer or yours. Because ultimately it isn’t a question that is addressed, but a person. Our whole being has to be answered. At that point, both question and answer disappear, like hunger after a good meal. “God is subtle, but not malicious,” Einstein said in a different context. We have to listen to the Voice from the Whirlwind in a more oblique mode, as if its true meaning lay inside the logical framework of its words. First, we should notice how the answer consists mostly of questions (a good Jewish trait). In their volume and insistence, these questions acquire a peculiar quality. They sound in our ears as a ground bass to the melody of their content, and eventually function as a kind of benign subliminal message, asking a fundamental question that will dissolve everything Job thought he knew. The closest we can get to that question is What do you know? During their dialogue, Job and the friends agree about the limits of human understanding, but none of them suspects how absolute those limits are. In order to approach God, Job has to let go of all ideas about God: he must put a cloud of unknowing (as a medieval Christian author expressed it) between himself and God, or have the Voice do this for him. The content of the Voice’s questions, aside from their rhetorical form, gives another kind of answer. Each verse presents Job with an image so intense that, as Job later acknowledges, he doesn’t hear but sees the Voice. He is taken up into a state of vision, and enters a world of primal energy, independent of human beings, which includes what humans might experience as terrifying or evil: lightning, the primordial sea, hungry lions on the prowl, the ferocious war-horse, the vulture feeding his young with the rotting flesh of the slain. Violence, deprivation, or death form the context for many of these pictures, and the animals are to them as figure is to ground. The horse exults because of the battle; without the corpses, the vulture couldn’t exist in his grisly solicitude. We are among the most elemental realities, at the center of which there is an indestructible power, an indestructible joy. There is another text that can be contrasted: the peaceable kingdom of First Isaiah, where the wolf lies down with the lamb. Beside Job’s vision, this seems a naive version of paradise, and as elusive as its direct descendent, the Marxist End-of-Days. Since Isaiah still equates the humane with the human, his desire turns wilderness into a zoo, stocked with nonviolent and vegetarian lions. The Voice, however, doesn’t moralize. It has the clarity, the pitilessness, of nature and of all great art. Is the world of flesh-eaters a demonic parody of God’s intent? And what about our compassion for the prey? Projecting our civilized feelings onto the antelope torn apart by lions, we see mere horror: nature red in tooth and claw. But animals aren’t victims, and don’t feel sorry for themselves. The lioness springs without malice; the torn antelope suffers and lets go; each plays its role in the sacred game. When we watch from the periphery, as in a television film, we can sense the dignity this relationship confers on both hunter and hunted, even in the midst of great pain. Do you give the horse his strength? Do you clothe his neck with terror? snort like a blast of thunder? or the flash of spear and javelin. Job’s first response is awe. He can barely speak. He puts his hand over his mouth, appalled at his ignorance. But there is more to come. The Voice now, in a series of gruff, most ironical questions, begins to speak explicitly about good and evil. Do you really want this moral sense of yours projected onto the universe? it asks, in effect. Do you want a god who is only a larger version of a righteous judge, rewarding those who don’t realize that virtue is its own reward and throwing the wicked into a physical hell? If that’s the kind of justice you’re looking for, you’ll have to create it yourself. Because that is not my justice. Who has begotten the dew? Out of whose belly is the ice born? Whose womb labors with the sleet? Does the rain have a father? The whole meaning is in the lack of an answer. If you say yes, you’re wrong. If you say no, you’re wrong. God’s humor here is rich and subtle, beyond words. And that its own sweet will is Heaven’s will. We come now to Job’s final speech. To misunderstand it will be to miss his transformation and to destroy the harmonic structure that gives a book its meaning. If Job’s response is unworthy, then God’s answer is unworthy. One is a mirror-image of the other. But self-abasement is just inverted egoism. Anyone who acts with genuine humility will be as far from humiliation as from arrogance. Wherefore I abhor myself indeed! How could this poet, after a venture of unprecedented daring, end with a hero merely beaten into submission? Thereby proving that the friends’ degraded opinion is correct after all, since Job, by acknowledging that he is a vermin among vermin, acknowledges the god who mistrusts his angels and in whose nose heaven stinks. Job’s final words issue from surrender; not from submission, which even at its purest, in the “Naked I came…” of the prologue, is a gesture in a power transaction, between slave and master or defeated and conqueror, and is always a mode of spiritual depression. Surrender, on the contrary, means the wholehearted giving-up of oneself. It is both the ultimate generosity and the ultimate poverty, because in it the giver becomes the gift. When Job says, “I had heard of you with my ears; / but now my eyes have seen you,” he is no longer a servant, who fears god and avoids evil. He has faced evil, has looked straight into its face and through it, into a vast wonder and love. Instead of bursting into fervid adoration as Arjuna does, Job remains a hairsbreadth away from silence. His words are a miracle of tact. We are not told the details of his realization; that isn’t necessary; everything is present in the serenity of his tone. All we know is that his grief and accusations, his ideas about God and pity for man, arose from utter ignorance. But we can intuit more than that. A man who hungers and thirsts after justice is not satisfied with a menu. It is not enough for him to hope or believe or know that there is absolute justice in the universe: he must taste and see it. It is not enough that there may be justice someday in the golden haze of the future: it must be now; must always have been now. Job’s comfort at the end is in his mortality. The physical body is acknowledged as dust, the personal drama as delusion. It is as if the world we perceive through our senses, that whole gorgeous and terrible pageant, were the breath-thin surface of a bubble, and everything else, inside and outside, is pure radiance. Both suffering and joy come then like a brief reflection, and death like a pin. He feels he has woken up from a dream. That sense, of actually seeing the beloved reality he has only heard of before, is what makes his emotion at the end so convincing. He has let go of everything, and surrendered into the light. We need to realize, though, that the author changed language again, and thereby changed realities. We have descended to the smaller humanity of the old legend. Here the new children are the old children: even though Job’s possessions are doubled, he is given seven sons and three daughters, as before, all of them instantaneously grown up; they have sprung back to life as gracefully as the bones of a murdered child in a Grimms’ tale. On another level, all the possessions, and the children too, are outer and visible signs of Job’s inner fulfillment, present beyond gain and loss. (“The Messiah will come,” Kafka said, “only when he is no longer necessary.”) Job’s anxiety has vanished. Even his god, though he still cares about burnt offerings and ritual expiation, is not split into a Lord and an Accuser, and no longer needs to administer loyalty tests. Indeed, he rewards Job for having said that the righteous aren’t rewarded and mildly punishes the friends for maintaining that wicked are punished. Blake, who with all his gnostic eccentricities is the only interpreter to understand that the theme of this book is spiritual transformation, makes a clear distinction between the worlds of the prologue and of the epilogue. In his first illustration to Job, he draws the patriarch and his wife seated at evening prayer, with Bibles open on their laps, their children kneeling around them; the sheep are drowsing, the dogs are drowsing, they themselves look up to heaven in drowsy piety, with all their musical instruments hanging silent on the central tree. The last engraving, however, shows a world transfigured: it is sunrise, the whole family is standing up, bright-eyed, each exuberantly playing his or her favorite instrument. There is something enormously satisfying about this prominence of the feminine at the end of Job. The whole yin side of humanity, denigrated in the figure of Job’s wife, and in Job’s great oath looked upon as a seductive danger, has finally been acknowledged and honored here. It is as if, once Job has learned to surrender, his world too gives up the male compulsion to control. The daughters have almost the last word. They appear with the luminous power of figures in a dream: we can’t quite figure out why they are so important, but we know that they are. The very last word is a peaceful death in the midst of a loving family. What truer, happier ending could there be? An extraordinary poetic achievement. I will keep it next to my Bible on my bedside table. The thoughtful reading of this astonishing translation has been for me a rare experience combining poetry and enlightenment. Stephen Mitchell’s Book of Job is a very forceful and direct translation, and conveys very well the vigor of both language and thought in the original. The unobtrusive but thorough and conscientious scholarship also makes the book extremely valuable. Stephen Mitchell’s version of Job succeeds in conveying a rush, a momentum, that are insistent, at times awesome, and often the bearers of a new insight into the meaning and power of the unique original. A fresh current and pace, throughout, and here and there a new (perhaps ageless) immanence. Stephen Mitchell has succeeded in making a splendid English poem out of the Hebrew of Job. I find myself simply amazed at how he has managed to create equivalents for the terrific muscularity and immediacy of the original — something that no previous translation has done, including the King James version, with all its fine old grandiloquence. I would add that as a work of painstaking yet imaginative Hebrew philology the translation is equally impressive. Mr. Mitchell has done a magnificent job of turning a majestic but confusing masterpiece into a marvelous poem which has point, lucidity, drama, and power. Only by reading it along with the translation we have all been brought up on does one realize the full measure of his achievement: I was never aware of just how incomprehensible many of the verses in the King James version are, and I am dazzled by Mr. Mitchell’s ability to compress and clarify without either distorting or trivializing. Many of the verses now have meaning as well as music. And the contemporary idiom works, sometimes with shocking and brilliant effects. This is, in all, an important original work of art, as well as a scrupulous and erudite translation, and it deserves the widest possible public. If Mr. Mitchell gives an eloquent account of the effects of Job’s poetry in his introduction, in the translation itself he does even better: he makes those effects come alive. Writing with three insistent beats to the line, and hammering home a succession of boldly defined images, he achieves a rare degree of vehemence and concentration. Here at last is the text for all who wish to read and teach one of the greatest of all poems in a version that captures the vigor and intensity of the Hebrew. Even those who cherish the King James version will welcome the clarity and force of Mitchell’s text, the driving rhythmic energy of the poetry: this is now a great English poem. Moreover, there is an exemplary Introduction, a deliciously written essay on the significance of the poem for our time; it alone is worth the price of the book…. We need the scholars to point out the radical and endearing details. We need the poets to renew our own literary inheritance. Scholar-poet Stephen Mitchell has put us all in his debt. Stephen Mitchell’s splendid new translation is so strong and vigorous that it would be possible to praise it by saying it seems wholly original. Mitchell’s translation is magnificent poetry, an outstanding recreation of a terrifying and inspiriting story that is thousands of years old. Where the text is intrinsically moral, criticism becomes a moral act. Stephen Mitchell’s superb translation of The Book of Job is moral in just this way — it puts us on the closest terms with the Old Testament book that many commentators regard as the crucial post-Holocaust parable.